From the deep woods of the Black Forest came cuckoo clocks, chocolate and cherry cake, and stories of Little Red Riding Hood and Hansel and Gretel getting lost among the trees. These days, the Black Forest is no longer a sinister, unknown place, where wolves and witches could be hiding around every corner. Instead, the Black Forest (Schwarzwald in German) is one of Germany’s top attractions, and the area is filled with hiking trails, castles, waterfalls. There are hundreds of small towns and villages scattered throughout the region, each with something different to offer. To help you with your planning, this guide examines five of the absolute best Black Forest towns for travelers. Within these towns are ruined castles, medieval town squares, plunging waterfalls, elegant spas, and more half-timbered houses than likely any other corner of the world. Each description contains information on both the town itself and nearby activities in the Black Forest. Read through the descriptions to get an idea of where to go, then continue on to the bottom of this guide for tips on visiting the Black Forest, including where to stay and how to get around. Essential Experience: Soaking in the thermal waters of one of the town’s spas. A throwback to the Victorian era, genteel Baden-Baden still attracts a well-heeled clientele who come to enjoy its aged elegance. Any signs of former rusticness in Baden-Baden have been carefully polished away, and instead of rambling through the forest, visitors here spend their time visiting the spa, perhaps dropping by the casino, and promenading along flower-filled Lichtentaler Allee, the town’s most famous street. Built over thermal springs, Baden-Baden has been famed as a spa destination since Roman times, and the ruins of these early baths can be visited in town. The two most popular spas in Baden-Baden are Caracalla Therme and Friedrichsbad which are located near each other in Römerplatz, the bath quarter of town. Caracalla is more modern with amenities like whirlpools and plunge pools while Friedrichsbad, built in 1877, is a more traditional spa experience with an elaborate series of hot rooms, steam rooms, and pools to make your way through before you reach relaxation nirvana. If you don’t want to visit the baths but still want to get a (literal) taste of the town’s supposedly restorative waters, head to Trinkhalle, the hillside pump room. Inside the neoclassical portico, you can have a glass of the mineral water that pours from the faucet. It’s linked to the same spring that Friedrichsbad uses. For those with money to spend (or if you just want to watch other people spend theirs), Baden-Baden is also home to an opulent casino, The casino’s gold trim, heavy chandeliers, and velvet covered walls all contribute to a scene of aged elegance, and, while it’s not quite Monte Carlo, James Bond would fit in easily at one of the tables. If you’re not interested in gambling, there are regular tours that allow you to see the interior of the building. If after rubbing shoulders with the VIP crowd, you want a reason to change out of your fancy clothes, take a short funicular ride up the top of Merkur Mountain. The funicular is a short bus ride from the center of town, and it’ll take you about five minutes to ride from the base of the mountain to the top. Walking to the top is also possible, although expect a steep and somewhat strenuous hike. Once you reach the top of Merkur Mountain, there are sweeping views of the Black Forest and Rhine Valley, as well as a restaurant, wooded walking trails, and a jumping-off point for paragliders. Essential Experience: Eating a slice of black forest cake from a table in the town square. Little Schiltach is what all other Black Forest villages aspire to look like. 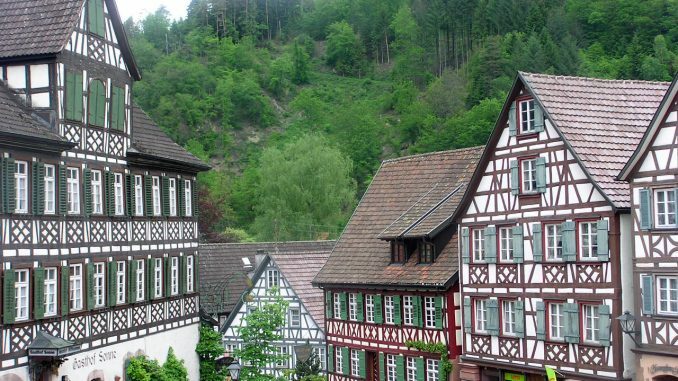 Founded in the 11th century, Schiltach is chock-full of restored half-timbered houses, perfectly framed by the edges of the Black Forest and intersected by a small river. It’s undisputed highlight is the town center, a cobblestone square surrounded on all sides by traditional buildings which used to house blacksmiths, tanners, and shopkeepers. The most enjoyable thing to do in Schiltach is to wander through the town, admiring the proliferation of half-timbered buildings and stopping to read the plaques marking sites of historical interest. When you want a break, pop into a tiny cafe and sample one of the traditional Black Forest cakes or pastries on display in the window. Schiltach also has a trio of tiny museums, focusing on the history of the town, the timber industry and, somewhat incongruously, bathroom design. After you’ve had your fill of quaintness in town, the Black Forest is just a short walk away. This part of the forest has long been used for timber harvesting, so it’s not as wild and densely wooded as other regions, but there are still numerous walking trails in the area. Additionally, there’s a zipline course located a short drive away in Hirschgrund. Essential Experience: Feeling the spray from the top of Triberg Waterfalls. Triberg has managed to both preserve its natural surroundings and maintain a long history of Black Forest traditions, making it a great place to experience the culture of the region as well as intact forest. One of the most important traditions Triberg carries on is the art of cuckoo clock making. Cuckoo clocks are an important part of Black Forest history, and they have been made in the region since the 1700s. Today, Triberg is the Black Forest’s unofficial cuckoo clock capital, and, every hour, the town center nearly shakes when the merchandise from numerous cuckoo clock shops lets out a cacophony of sound. Two of the most famous cuckoo clock shops are House of 1000 Clocks and Oli’s Schnitzstube, both of which specialize in high-quality, handmade clocks. However, Triberg has not lost its soul to tourism. The vast majority of shops are small and housed in traditional-style buildings, and it’s easy to wander through town and still get a sense of its history and humble beginnings as a small village in the backwoods of the Black Forest. The town center is also home to the Black Forest Museum (not to be confused with the Black Forest Open Air Museum located near Gutach). This museum is an enjoyable way to learn more about the history and traditions of the Black Forest. There are exhibits on traditional clothing, cuckoo clocks, and musical instruments, to name a few. To experience Triberg’s natural side, take a 15-minute walk north or catch the small tourist train to the Triberg Waterfalls. These are the highest waterfalls in Germany, plunging 535 feet over several cascades. There will likely be lots of visitors scampering around the falls, but if you want to get away from the crowds, there are several short walks in the woods around the area, as well as longer walks in the surrounding region. The waterfalls are a long-standing tourist attraction, so the woods around them are relatively untouched. Here is one of the last places you can see the Black Forest as it was before many of the natural species were cut down and replaced with species better suiting for timber harvesting. Wander through the woods long enough and you may begin to understand why the Romans gave the Black Forest the name they did. At the time, the trees were so dense that no light seemed to break through, cloaking the ground in darkness. Essential Experience: Taking in the views of town from the top of Heidelberg Castle. If you can only visit one town in the Black Forest, make it Heidelberg. Whether you’re looking for nature, history, or a lively town center, Heidelberg has it. Here you’ll find a traditional old town, or Altstadt, complete with several town squares, a handful of churches, and the Alte Brücke (Old Bridge) which spans the Neckar River and is adorned with a bronze sculpture of a cheeky looking monkey. Outside the old town, but still heavy with history, is Heidelberg University, Germany’s oldest university and one of its most renowned. Several buildings from the 18th and 19th centuries still stand and can be visited by non-students. Two of the most popular sites are the University Library, which has a collection of rare books and papers, and the Student Jail, where past students who committed offenses like rowdiness and dueling were sent for a night or so to ponder their misdeeds. The walls of the jail are filled with graffiti by the imprisoned, many of whom seemed to feel that a stint in the student jail was more of a rite of passage than a punishment. To go further back in time, walk or take the handy funicular up the hill overlooking Old Town where the town’s top attraction, Heidelberg Castle, sits. The castle was originally built in 1294, however; war, fire, and a couple of lightning bolts destroyed large sections of the building which were then rebuilt several times over the centuries. Today, the castle is somewhat of an attractive Frankenstein structure, with architecture from different periods meshed together. After purchasing a ticket, you’ll wander past medieval stone ruins, Gothic and Renaissance buildings, and the world’s largest wine cask (put out of commission due to leakage). The building is flanked by forest on one side and a drop-off to the river on the other, and standing on a castle balustrade offers outstanding views of Heidelberg and the surrounding area. Heidelberg Castle has been one of the Black Forest’s top attractions for centuries, and luminaries such as Goethe and Mark Twain were two of the many to appreciate the castle’s history and romantic setting. Despite all the people who have lived in and developed Heidelberg, it’s still easy to reach the Black Forest from town. The best route is to follow the Philosophenwag (Philosopher’s Way) along a winding path onto the opposite side of the river as the castle and Old Town. From here, the path climbs upward, and there are numerous short hikes you can take through the woods or the gardens lining the pathway. Essential Experience: Watching the reveal of a new Advent window during the annual Christkindlesmarkt. Another Black Forest village dating from medieval times, every street corner in Gengenbach seems postcard worthy. Radiating from the town center, Gengenbach is filled with narrow cobblestone streets, stone fountains, and traditional buildings. Many of the half-timbered houses are decorated with brightly painted shutters, flower boxes filled with geraniums, and bronze lanterns hanging from the doorway. Wander through the back streets of town and you’ll come across hidden gems like a medieval well, stone turrets, and the Narrenmuseum Niggelturm, a small museum exploring the history of witch burning in Gengenbach and the Fasend Festival the town celebrates every February. A highlight in Gengenbach is the town’s church, Stadtkirche Sankt Marien. The church’s importance to villagers is shown by its beautifully painted interior and the carefully tended gardens surrounding the building. Gengenbach looks like a scene out of a fairy tale in any season, but one of the best times to visit is in the runup to Christmas. This is when Gengenbach hosts a Christmas market, or Christkindlesmarkt, and the town square is filled with wooden stalls selling everything from wool mittens and hand carved nativity sets, to sausages and mulled wine. During this time, Gengenbach’s town hall is transformed into the world’s largest Advent calendar. Each night before Christmas in December, a new window in the front of the building is uncovered to reveal a scene depicting that year’s Advent theme. The Black Forest was one of the first areas in Europe to host Christmas markets, and Gengenbach is a standout place to see a traditional Christkindlesmarkt that isn’t overly commercialized or overrun by crowds. Neatly tended vineyards surround much of Gengenbach, but wander past them and the Black Forest itself is easily in reach. Hikes in the area range from about 1-13 miles, and maps can be purchased at the tourist office or from some of the shops in town. If you’re looking for a shorter walk, there are hiking trails along some of the vineyards close to town. You won’t be actually in the forest, but you’ll have outstanding views of it, as well as Gengenbach itself. The most popular time to visit the Black Forest is in summer, when the weather is best and attractions have the longest hours. However, this is also when most tourists come to visit, and some of the smaller towns can feel overrun. Visiting in late spring or early fall can give visitors the best of both worlds, with pleasant weather and fewer crowds. It’s also possible to visit the Black Forest in winter, and if you arrive after a recent snowfall, you’ll have the pleasure of seeing the forest transformed into an icy fairy tale landscape. Because winter is the quietest season for tourists, many smaller museums and attractions are closed or only open on the weekends, although Christmas markets will be in full swing during the month of December. The Black Forest region is best explored by car or train. Traveling by car can be the better option if you want more flexibility or want to visit hiking trails or sites that aren’t near a town, such as the Black Forest Open Air Museum. Train travel is very popular in the Black Forest, and each of the towns in this guide can be easily visited by train. Because they are all located in the western Black Forest, you can also easily reach one location from any of the others. Gengenbach, Triberg, and Schiltach are all located on the scenic Black Forest Railway, with Baden-Baden and Heidelberg easily reached by changing lines. Additionally, over 100 hotels and resorts in the Black Forest provide guests with a free KONUS card. This card, valid for the length of your stay, gives you free travel on area train and bus lines, allowing you to travel within the Black Forest for free. To get across shorter distances, there are numerous walking and cycling paths around towns and in different parts of the forest. The paths are all well marked, but if you’d like to have a map, tourist offices sell a variety of them. GPS also works throughout most of the forest. While the Black Forest is home to some posh resorts, most accommodations are small hotels in traditional buildings with a few rooms each. Many of these include an on-site restaurant where you can try Black Forest specialties like smoked ham, spätzle, and black forest cake, washed down with a glass of local Riesling. Because many villages in the Black Forest are small enough to be visited in a day (although longer stays are always enjoyable), many people choose 1-2 “bases” and take day trips from there. From this list, Baden-Baden, Gengenbach, Schiltach, and Triberg are all located 90 minutes or less from one another, so any of them could be chosen as a base to visit the other three from. If you prefer smaller villages, choose Gengenbach or Schiltach, while if you want to be surrounded by more activity and amenities, Baden-Baden or Triberg are better options. Heidelberg is located 1-3 hours north of the other towns in this guide, and since there’s enough in town to easily fill several days of sightseeing, it makes another good base on its own. The Black Forest is crisscrossed with trails that can take anywhere from less than an hour to over a week to complete. Each village has short hiking trails in the woods nearby, and many connect to longer walks. The three most popular long-distance hiking trails are the Westweg (in the western Black Forest), the Mittelweg (in the central Black Forest), and the Ostweg (in the eastern Black Forest). Each of these trails run north to south and range between 150 and 175 miles, although you can always choose shorter sections to walk instead of completing the entire route. All of these trails are to the east of the towns listed in this guide, with Westweg being the closest. However, each can be easily reached by car or a train/bus combination. Many towns and regions of the forest have themed walking trails that point out areas of interest like designated nature areas or sites supposedly used by the Brothers Grimm in their fairy tales. Check out brochures at town information centers to see what each place has to offer. For those looking for true wilderness, the newly-created Black Forest National Park is a nearly 40 square mile region (composed of two separate areas) located to the south of Baden-Baden. There are numerous walking and cycling paths within the park, allowing you an up-close look at the most untamed areas of the forest.